Last week, I blogged about the tax reasons direct real estate investment may be a better, more tax-efficient choice than using options like an IRA or 401(k). You probably want to read that post first (click here), but to give you a quick overview: Direct real estate investment offers up some really sweet, and I mean really sweet, tax advantages that probably in a variety of areas beat those offered up by an IRA or 401(k). A first quick point, and one I’ve made before at this blog. Options like IRAs and 401(k) accounts let you quickly and easily save money. You can literally write a check and “have the deduction” in the time it takes you to read this sentence. Furthermore, you can invest pretty much any amount—$100, $500, $2,000—up to the limit. Note: I talked about the convenience of deployment factor in another blog post here, just in case you’re interested. Related to the preceding point about fast and easy deductions, I need to say this. Yes, with real estate, you can create a series of large on-going deductions using depreciation that mean you’re enjoying all sorts of tax deferred growth in your wealth. But with tax-advantaged retirement accounts, this deferral will occur naturally and automatically. And that’s a big benefit if your taxable income is high. Using real estate to do this will mean you need to either accept that some of your rental property income will be taxed as your rents increase and you use up the depreciation. Or you will need to continue to add new properties with new stuff to depreciate to your holdings. You can definitely do this. But the process requires work—and with an IRA or 401(k) you don’t need to do any work. Another important point about options like Simple-IRAs and 401(k)s: When you do have available an option where you get free money because of an employer match, you simply can’t beat that. Getting an immediate, riskless 50% or 100% “return” on your investment is just an outstanding deal. No real estate deal ever produces a riskless return this good or this fast. I danced around the issue of asset allocation in the first post on “real estate vs IRA and 401(k) accounts”… sort of suggesting, hey, don’t worry, you can adequately and appropriately diversify your investments even if you’re direct investing in real estate. But you know what? It’s going to be far, far easier to do a good job with asset allocation and diversification if you’re using index funds inside of IRA and 401(k) accounts. With tax-deferred investments, you’ll also easily be able to rebalance your portfolio over time to deal with things like changes in your ability to bear risk. You will find it much more difficult to diversify and spread your money around if you start having individual assets (rental houses, apartments, and so on) in your investment portfolio that are worth $100,000, $200,000, or $1,000,000 each. Another benefit often not appreciated? 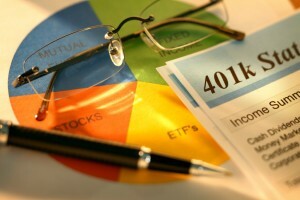 Typically investments you hold inside an IRA or 401(k) are protected from the claims of creditors. You want to check with a local attorney for the rules in your state. But as a general statement, money you’ve stashed in a retirement account can’t be seized by creditors. One final, important issue to consider with regard to IRAs and 401(k) accounts. And what’s more, these IRA and 401(k) options don’t burden you with extra work. Your IRA will never call late at night because the furnace is broken. Your 401(k) won’t require you to know how to evict a tenant. Now, admittedly, the extra work of direct real estate investment doesn’t have to be that hard to deal with. And you’re getting paid for the work or can pay someone else to do the work. But still, there’s something darn convenient (if a little boring) about outsourcing all your investment management and maintenance to a big financial services firm. If you’re successfully using IRAs and 401(k) accounts now—especially if you’re getting an employer match—hey, you’re doing great. And if you keep doing this, you’ll be one of the few people who end up with a nice-sized nest egg for retirement. Given this, I would not try to “fix” something (your retirement savings approach) given that it’s not broken. Finally, if you’re currently maximizing your IRA or 401(k) and you want or need to save still more money, direct real estate investment merits consideration—especially if you or your spouse can qualify as a real estate professional or if you can use the active real estate participation rules to fully deduct real estate-related losses. If you’re a real estate investor, you probably have more opportunity than you even realize to reduce your end-of-year tax bill. Some real estate investors even have opportunities to enjoy true, tax-free income. If you’ve tried to get actionable information about how to do this sort of tax planning, however, you may be frustrated. Real estate brokers and agents often don’t keep up to date on the rules. Fellow real estate investors often get the details scrambled. And many tax accountants don’t specialize enough in real estate to truly think outside the box. 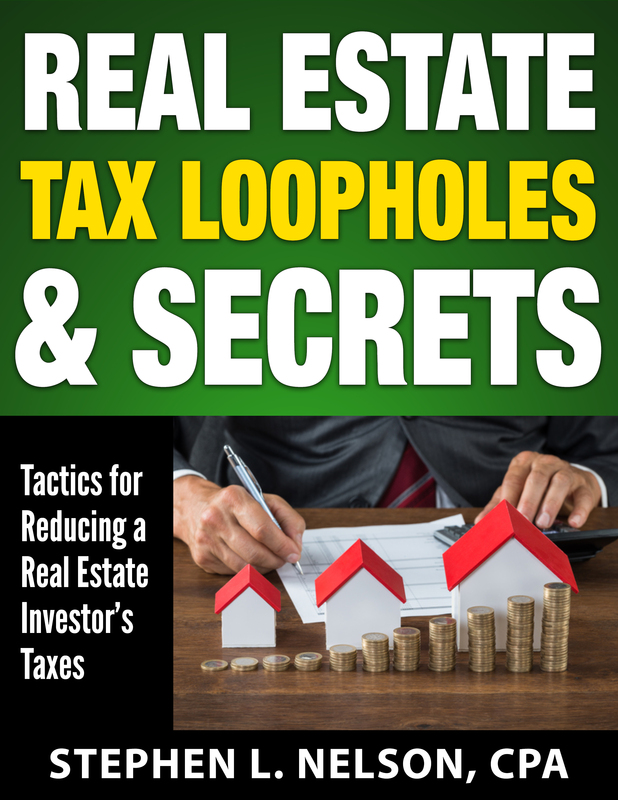 As a result of these factors, real estate investors often try to get this information by “reading between the lines” of official Internal Revenue Service documents or perhaps by carefully pouring over real estate investor forums. 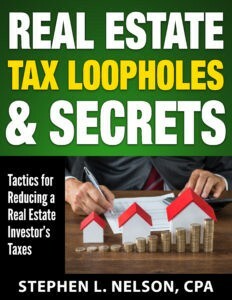 But you’ve got another option, too: Our Real Estate Tax Loopholes & Secrets ebook. Available for immediate download, this 50-page ebook explains how you can use tax law rules to your advantage.